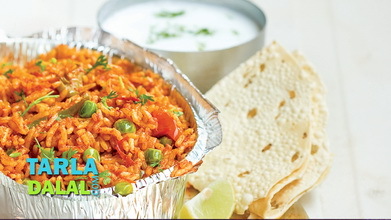 Vegetable biryani is the most popular and the most common rice dish that comes to one's mind when you think of indian cuisine. . . It is very tasty and definately worth a try ! 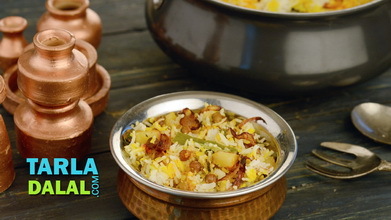 Combine 4½ cups of water, bayleaf, cinnamon, clove, cardamom, rice and salt in a deep non-stick pan, mix well and cover with a lid and cook on a medium flame for 10 minutes or till the rice is cooked. When the seeds crackle, add the onions and sauté on a medium flame for 1 to 2 minutes or till the onions turn translucent. Add the ginger-green chilli paste, turmeric powder, coriander powder, chilli powder and garam masala and sauté on a medium flame for a few seconds. Add the tomatoes and 2 tbsp of water, mix well and cook on a medium flame for 4 to 5 minutes. Add the mixed vegetables, paneer, salt and milk, mix well and cook on a medium flame for another 2 to 3 minutes, while stirring occasionally. Combine the curds, coriander and saffron colour in a bowl and mix well. 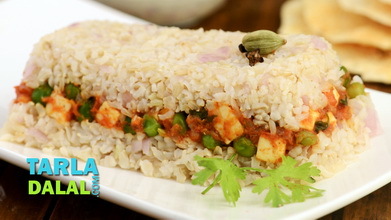 Add the prepared rice, mix well and divide into 2 equal portions. 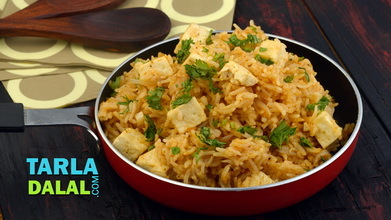 Put a portion of the rice in a handi and spread it evenly with the back of a spoon. Add the prepared vegetable gravy on it and spread it evenly. 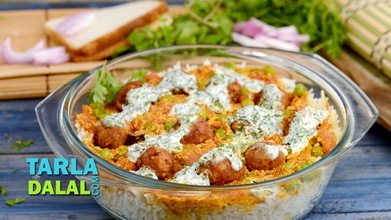 Top it with the 2nd portion of the rice and spread it evenly. Pour the ghee evenly over it and cover it with a lid. 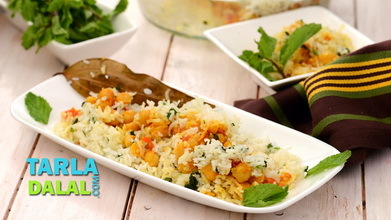 Place the handi on a non-stick tava (griddle) and cook on a slow flame for 25 to 30 minutes.